The dire warnings about minimum-wage increases keep proving to be wrong. So much so that in a new paper, the authors behind an earlier studypredicting a negative impact have all-but recanted their initial conclusions. However, the authors still seem perplexed about why they went awry in the first place. 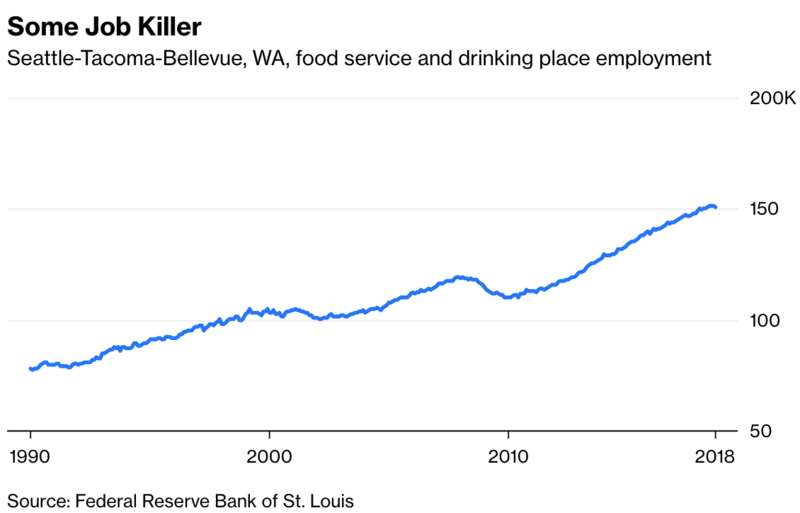 Seattle, like some other thriving West Coast cities, a few years ago passed an ordinance raising the minimum wage to $15 an hour in a series of steps. The law was a partial response to rising income inequality and poverty in the city, which began its postcrisis economic boom well before the rest of the country. The reaction was immediate, strident — and deeply wrong. The increase was an “economic death wish” that was going to tank the expansion and kill jobs, according to the sages at conservative think tanks. The warnings were as unambiguous as they were specific: expect restaurants to close in significant numbers and unemployment to rise, all because of this foolish attempt to raise living standards. Alas, if only the critics has done their homework first, instead of using scare tactics. Increasing revenue for lower to middle class workers almost always translates into economic prosperity. These wage earners spend s higher % of their income and most of it is spent locally. This in turn generates a higher velocity (or turn) of the dollar and is able to leverage a higher gross margin return for every initial dollar spent. It’s pretty basic economics that the Trickle Down gang don’t want people to believe in. Nice find HipKat. I too believed raising min wage was a good thing. I never expected what this article has found though and could not be happier for the positive effects. More than a few other countries have a living wage in this sector and a no tipping policy. I never assumed it would work well in US but apparently it does. Maybe the same ideological zealots like Rush and others who were ardently against this maybe inadvertently believed data from the same pollsters who got the last Presidential election prediction so very wrong. Last edited by cba fan; 01-02-19 at 02:53 AM. A rising tide lifts all ships is what I say. The net effect is that skilled positions should be paid more especially since inflation has eaten up prosperity in our wages. The real issue is not that fast food workers want $15 but that wages have not risen along with profits and productivity. Kids straight out of college with Bachelor's and Master's degrees are making those kind of wages at the start under crushing student debt. At its core I think it's not entirely accurate to peg this on Republicans but more on Big Business especially Leftist companies like Amazon who pay their workers peanuts to slave all day in their warehouses. Does Sacklicker know that his account was hacked by a liberal? Yes, from what I've seen all of the Republicans voting against wage hikes and for "Right to Work (for less)" laws are Koch brother money recipients. Those are the ones we want to ditch. Democrats are equally at fault by taking the Socialist angle for wake hikes without addressing the two points that you mentioned which is especially egregious since they're at fault for the recent healthcare hikes due to their support of ObamaCare. Until there's 100% coverage, whether through private health plans or a government provided health system, the system will not be efficient as those that are uncovered will always be provided care at the expense of those that are covered. The goal of the original Obamacare proposal was to have 100% coverage through the private health care insurers (along with the VA, Medicare/Medicaid).